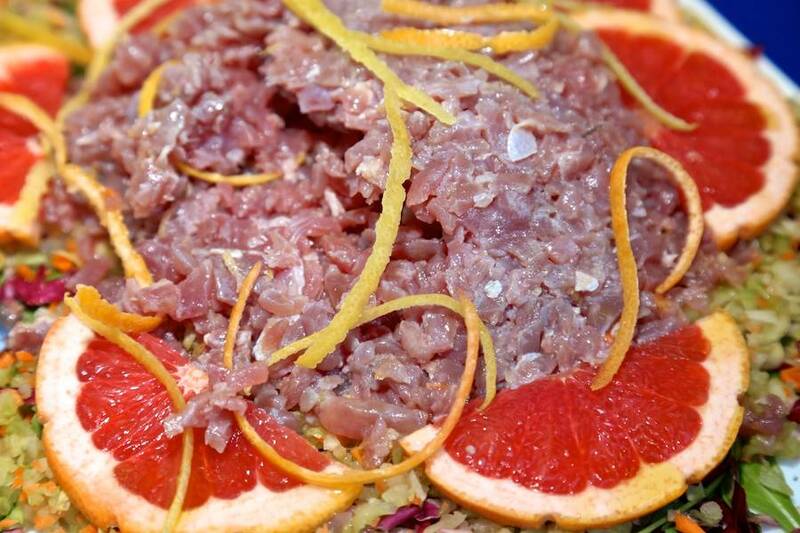 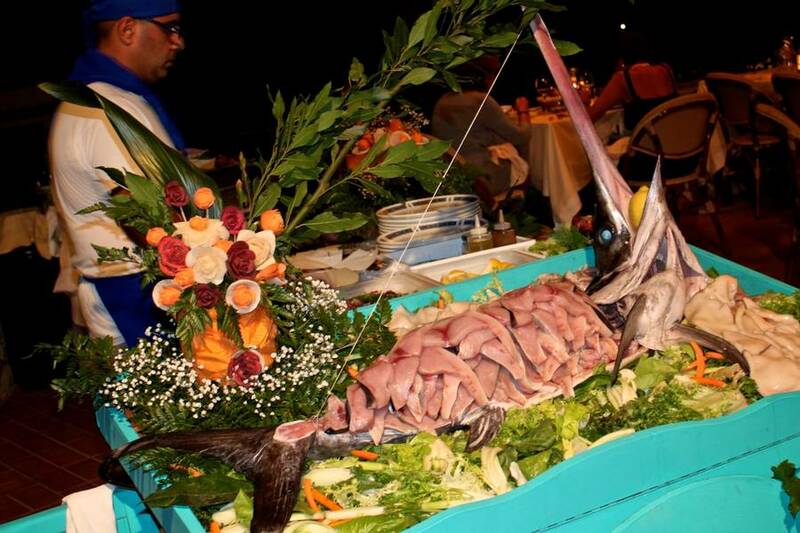 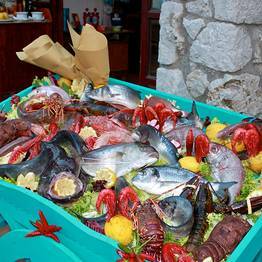 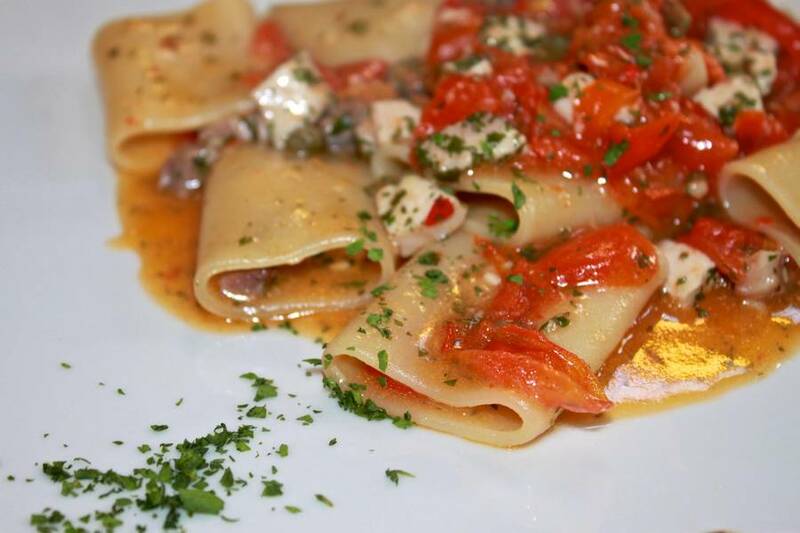 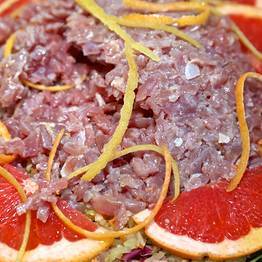 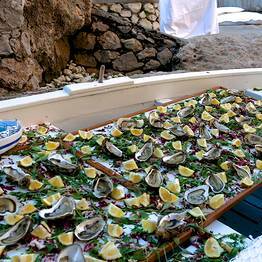 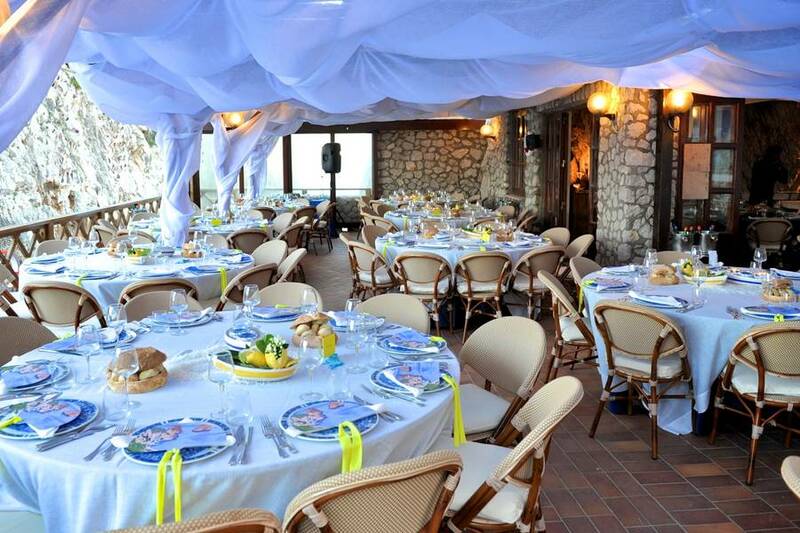 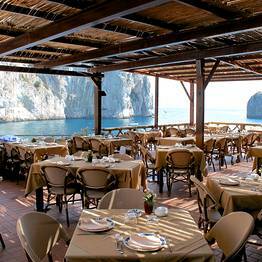 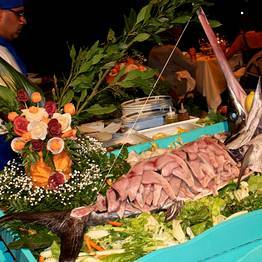 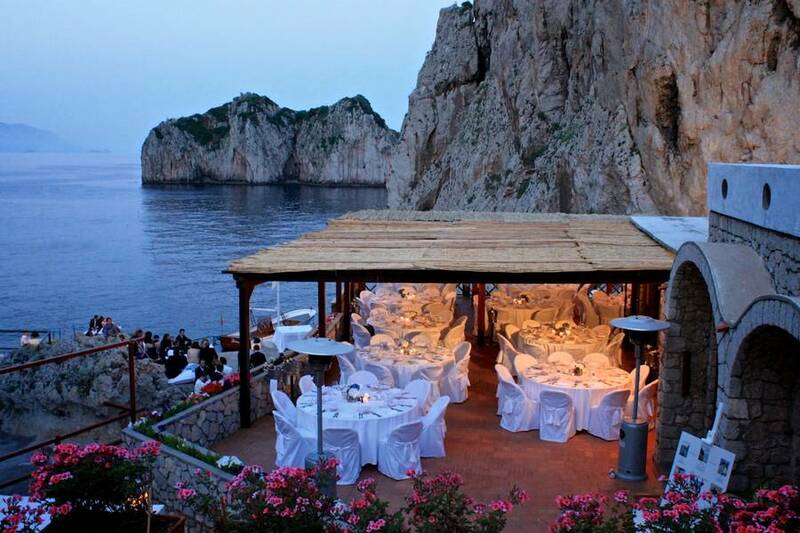 If you had to use just one word to describe Capri's Da Luigi ai Faraglioni restaurant it would have to be "unique". 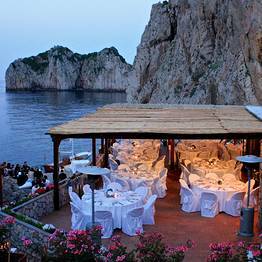 Unique like the eatery's water-edge location, on a rocky terrace at the feet of Capri's legendary Faraglioni; unique for its superlative food; unique for the atmosphere which, since 1936, has been attracting celebrities from every corner of the world. 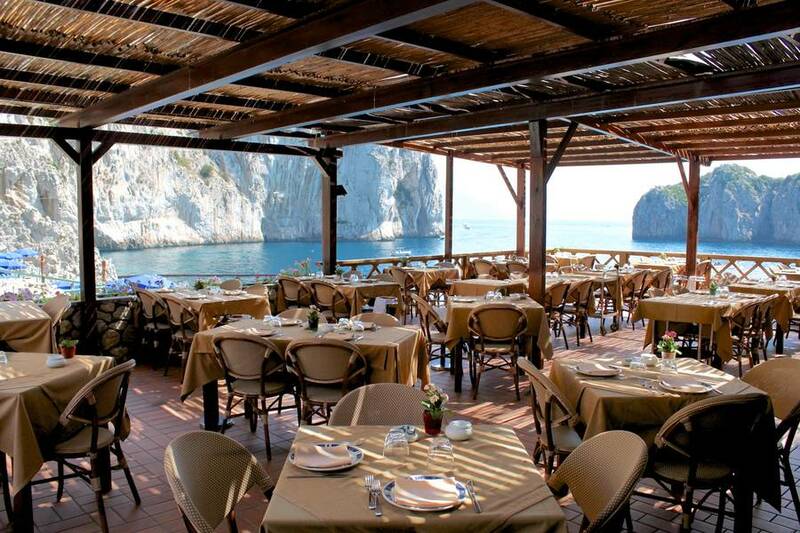 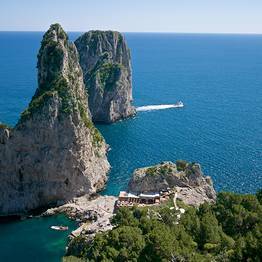 Overlooking the small bay framed by the Faraglioni and the Monacone sea stacks, Da Luigi ai Faraglioni is famous for both its unbeatable location and its excellent island cuisine. 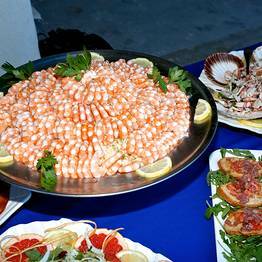 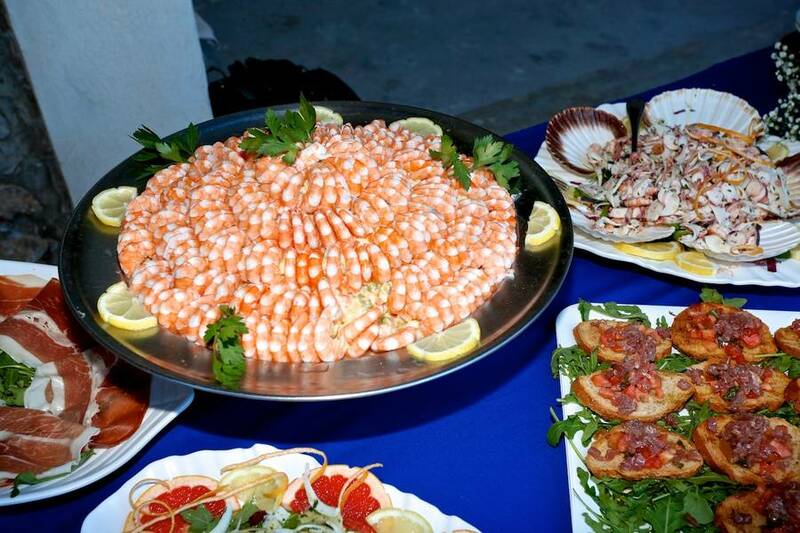 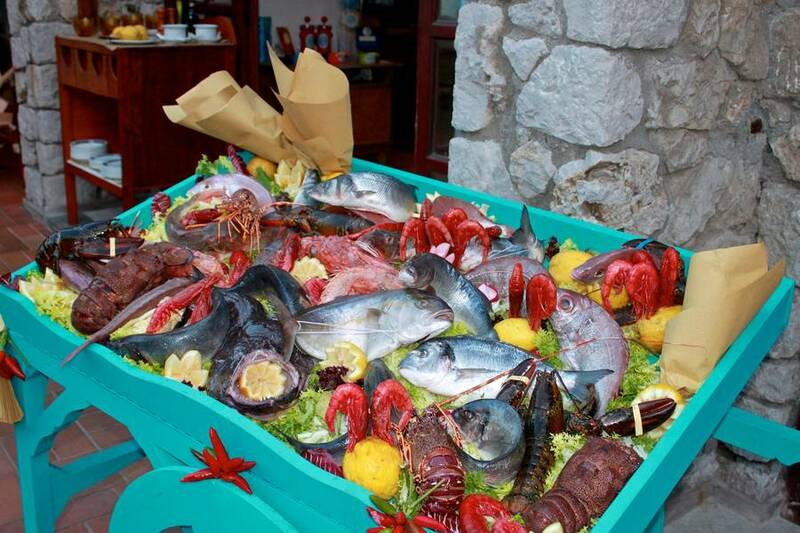 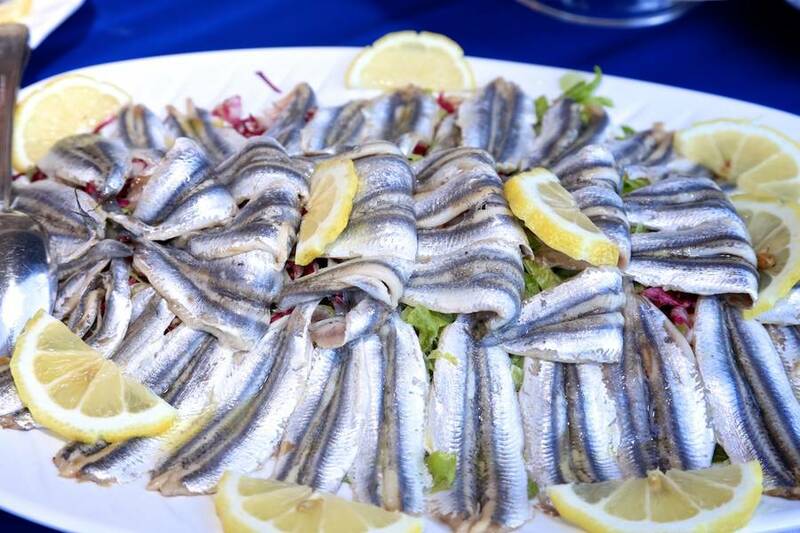 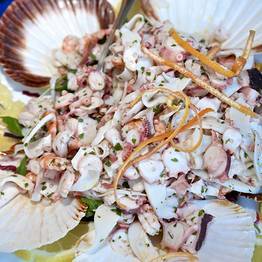 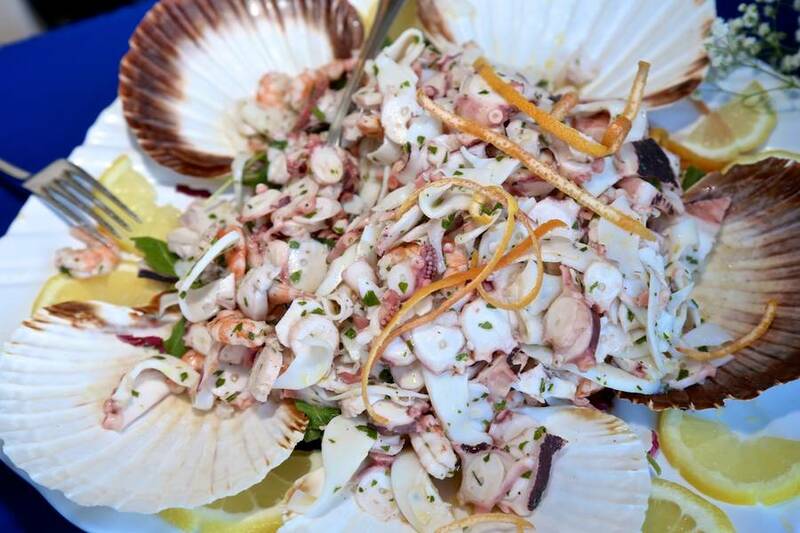 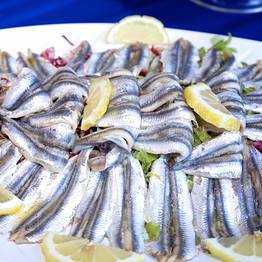 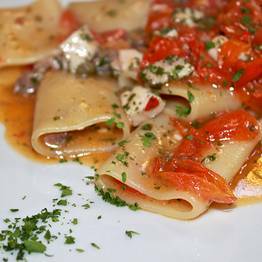 As you would expect, fish and seafood dominate the menu, bursting with the exquisite flavors and aromas of the Mediterranean. 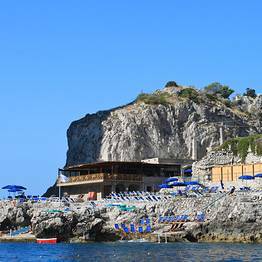 Open from dawn until dusk, Da Luigi ai Faraglioni is also a prestigious bathing establishment where both islanders and holidaymakers come to enjoy blissful hours of relaxation: soaking up the glorious Mediterranean sun and swimming in the warm, crystal clear sea. 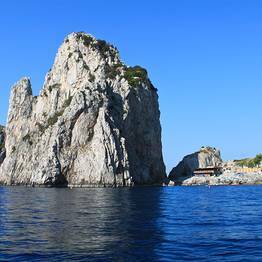 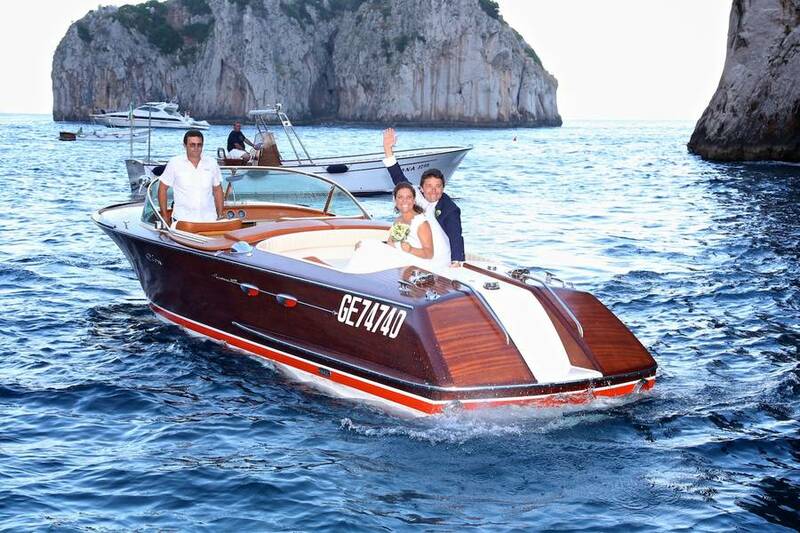 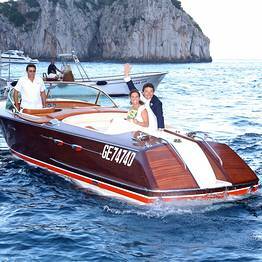 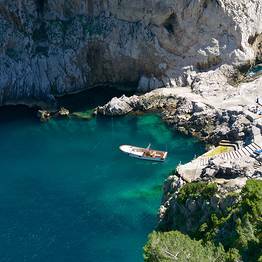 A shuttle boat service links Da Luigi with the Canzone del Mare, in Marina Piccola, allowing for a comfortable return journey to the center of Capri. 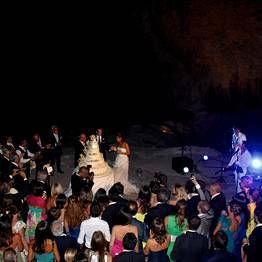 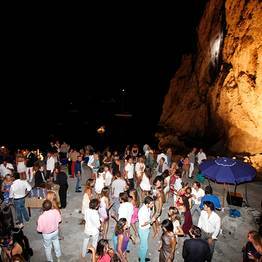 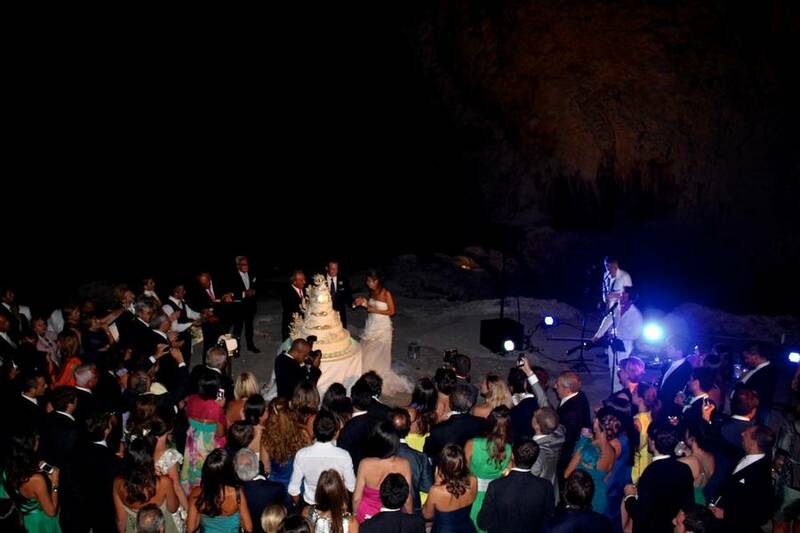 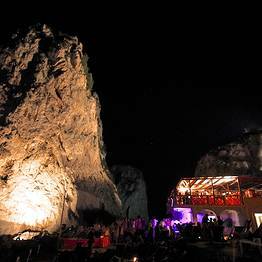 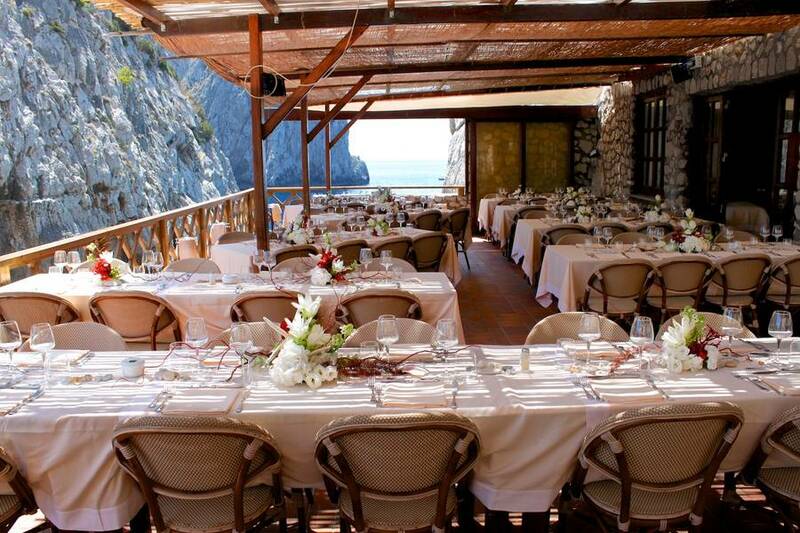 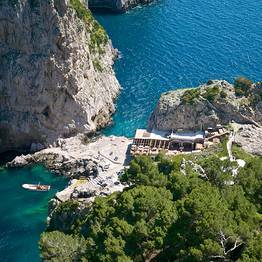 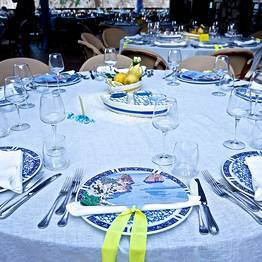 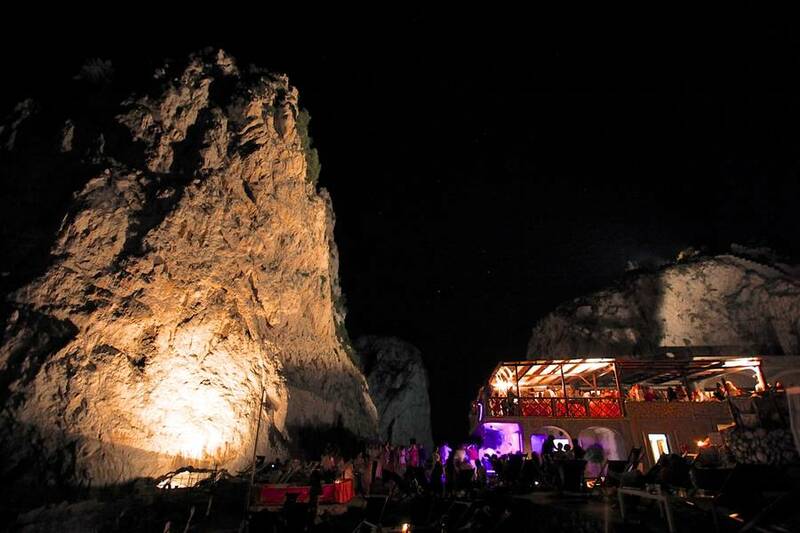 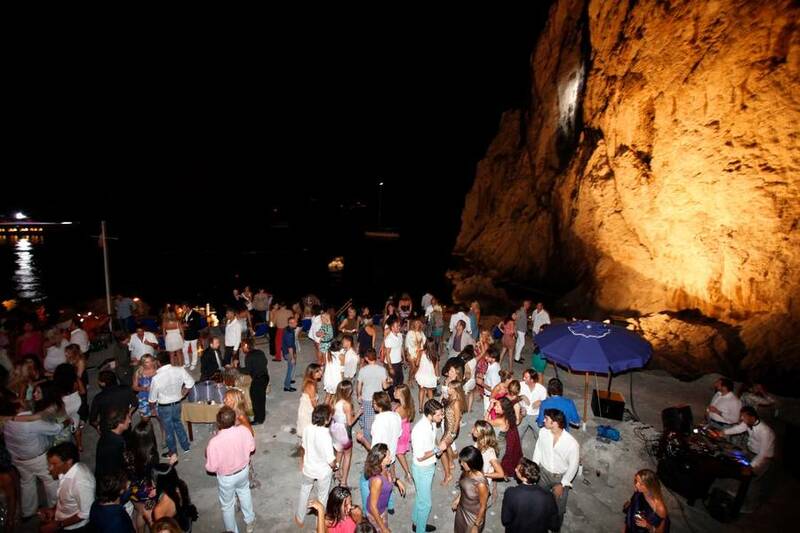 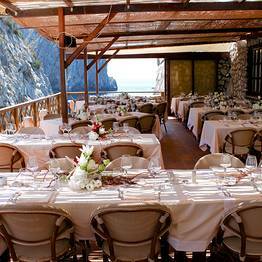 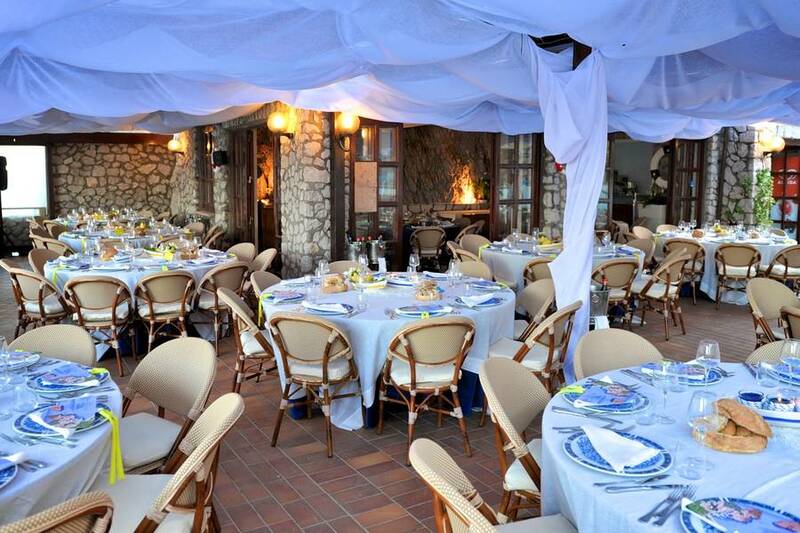 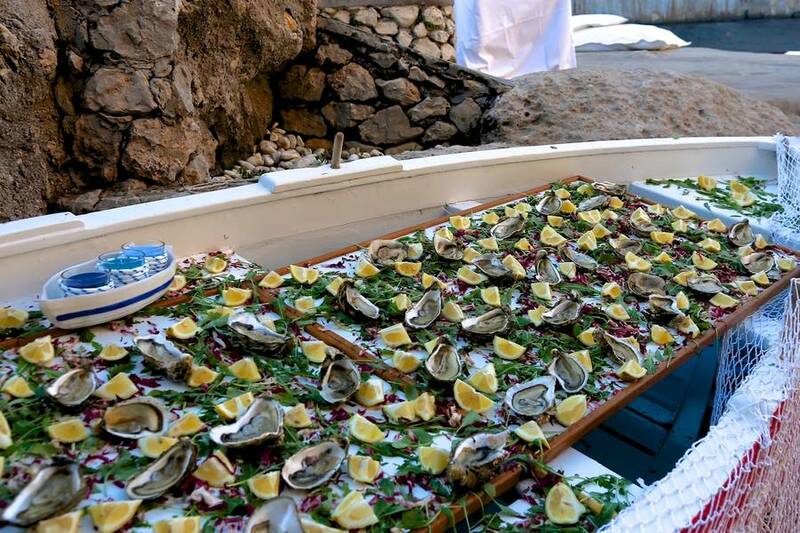 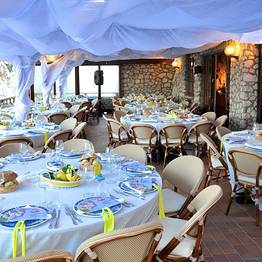 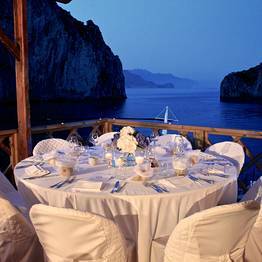 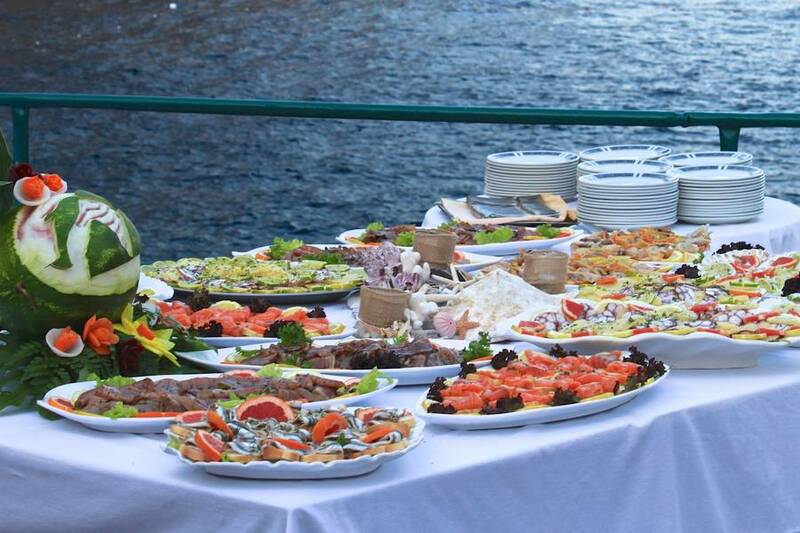 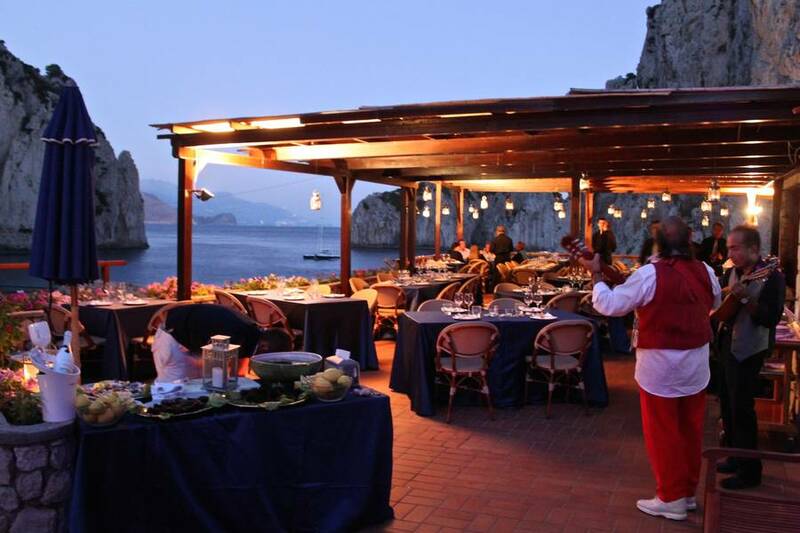 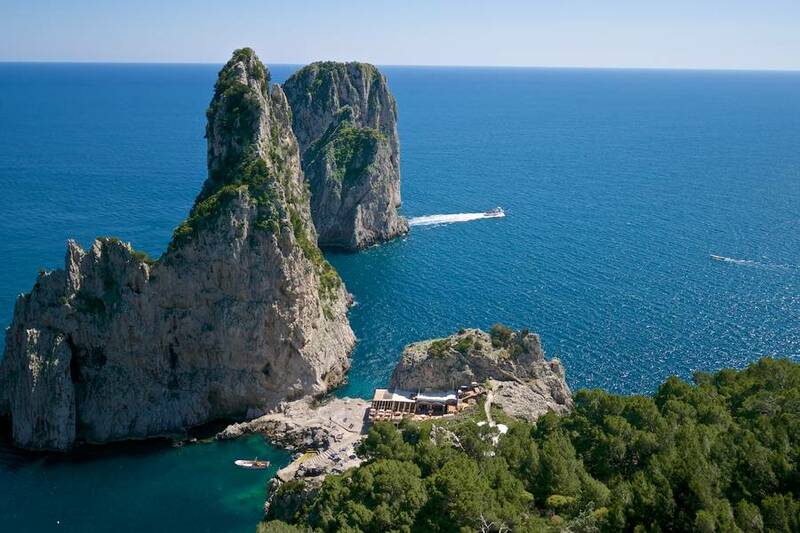 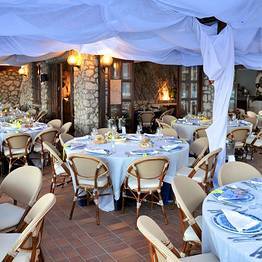 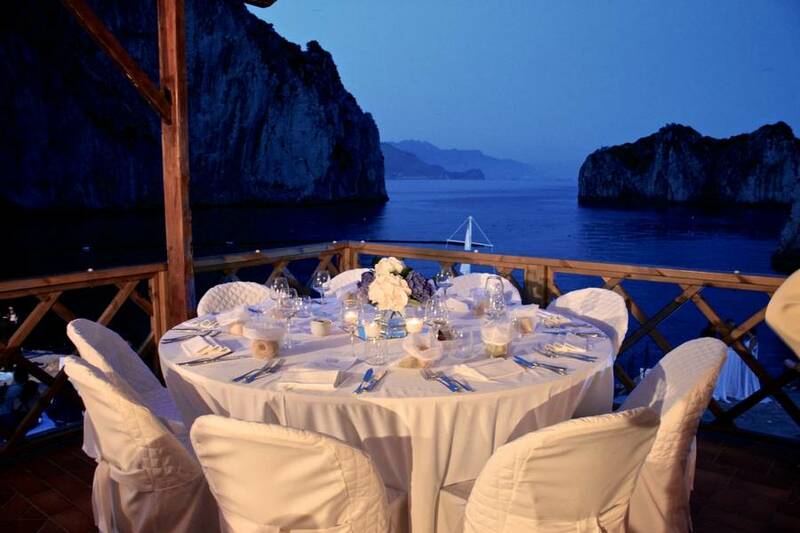 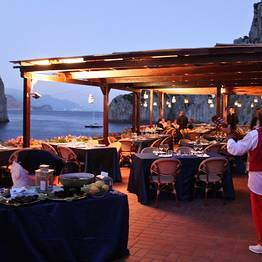 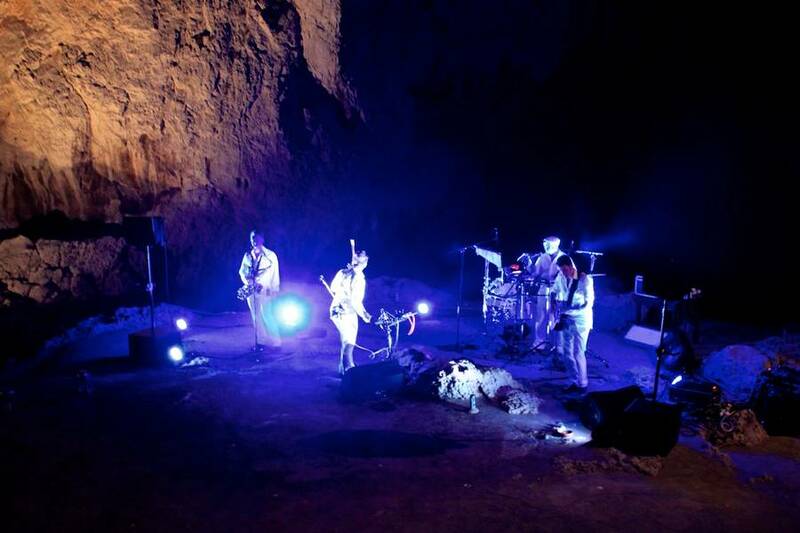 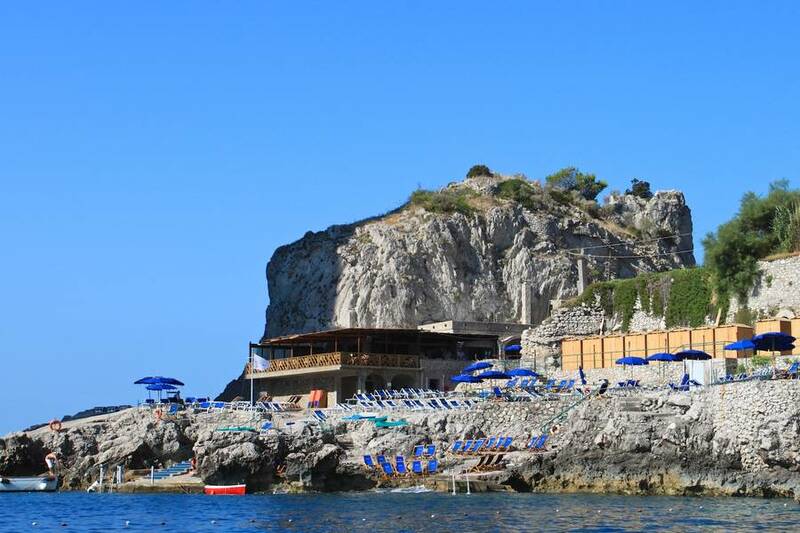 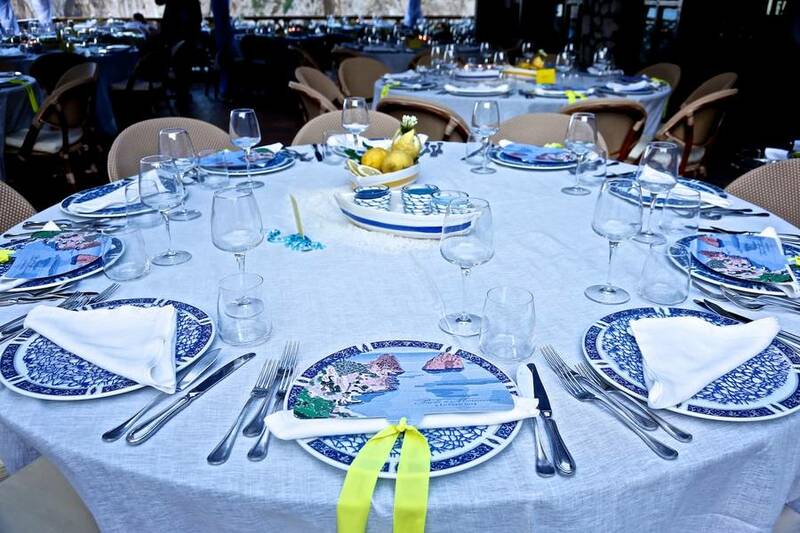 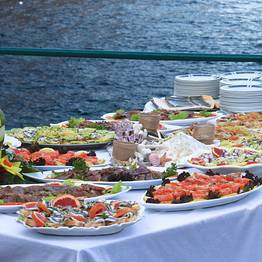 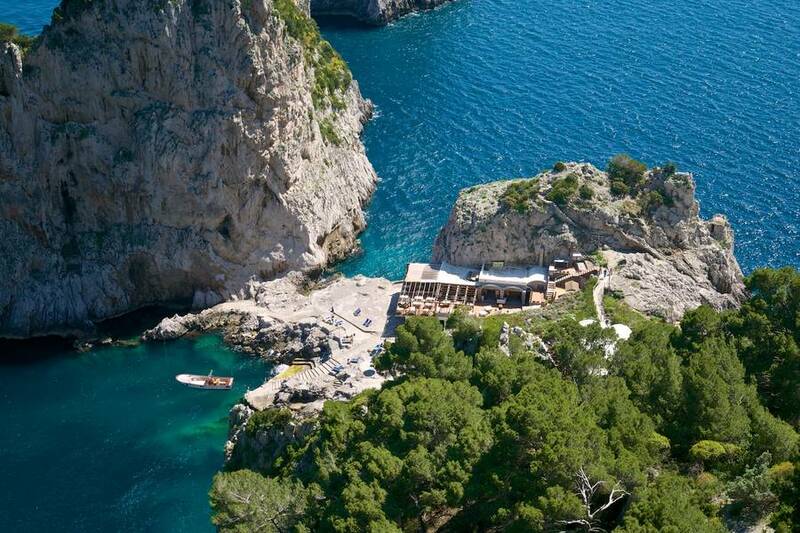 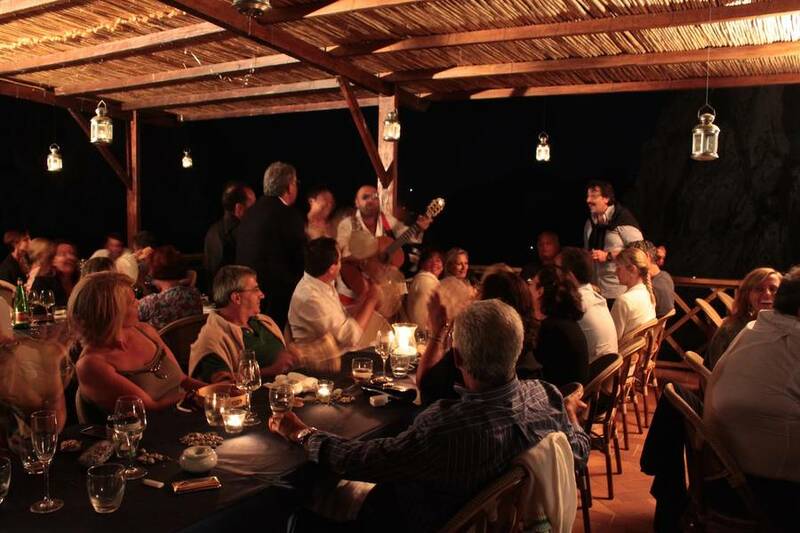 An enchanting venue for a gala dinner or a private party in the shadow of the Faraglioni rocks, on request Da Luigi ai Faraglioni also caters for exclusive evening events. 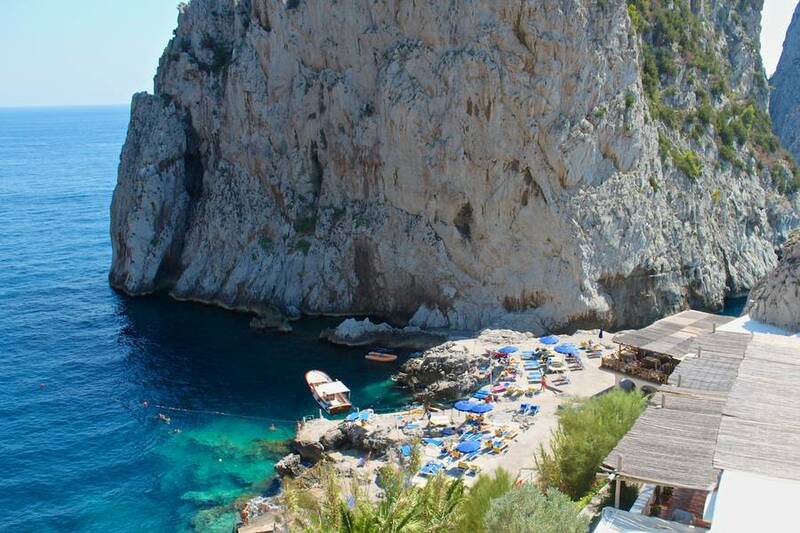 Great day at the beach in Capri! 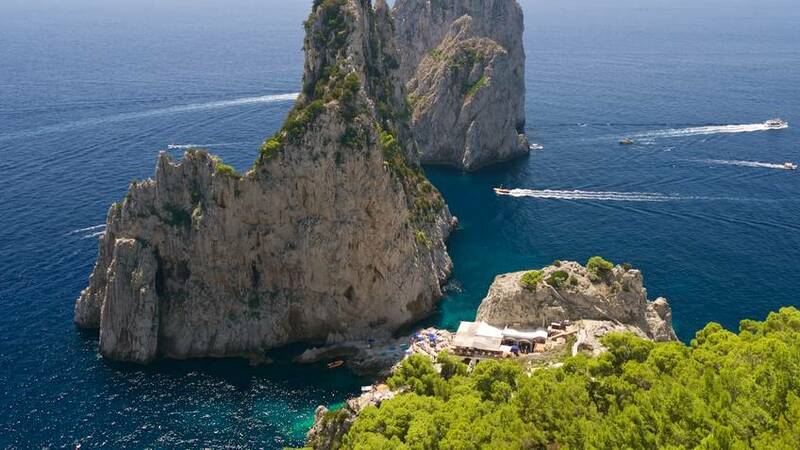 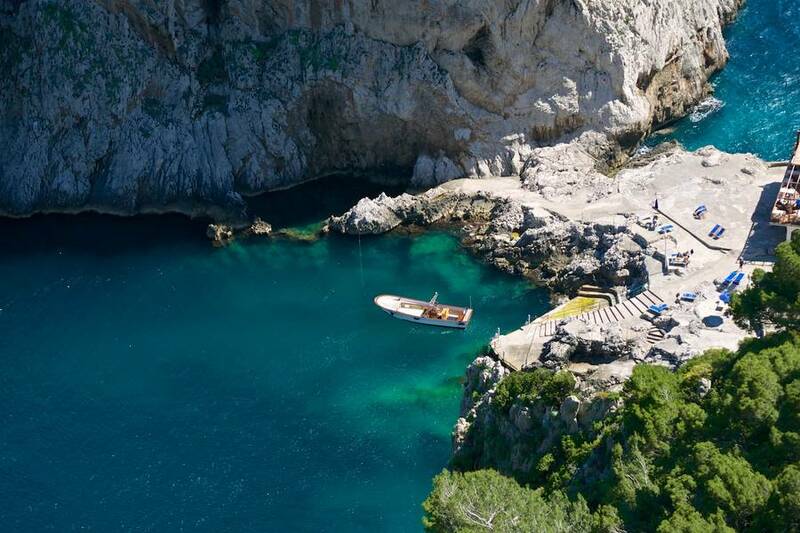 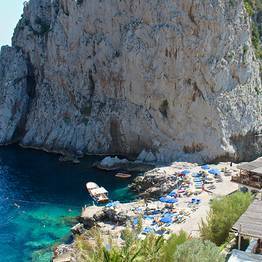 To reach the Da Luigi ai Faraglioni restaurant and bathing establishment, make your way to Belvedere Tragara, a five minute walk from the center of Capri, and from here take the little path amidst the coastal pine trees which leads down to the sea and the Faraglioni rocks. 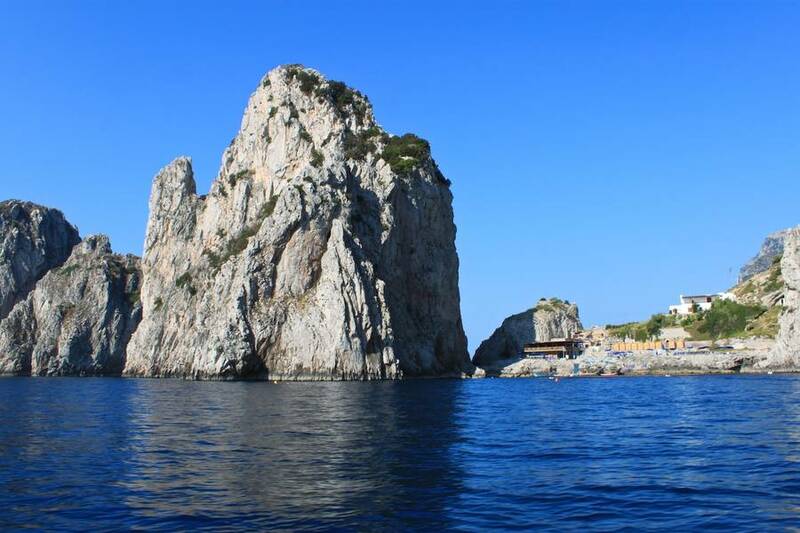 You can make the return journey aboard Da Luigi's shuttle boat which leaves customers in the Bay of Marina Piccola, from where you can easily reach the center of town, by bus, taxi, or on foot.